Adventure tours in Margaret River are offered far and wide by a lot of different tour operators. The Margaret River Region caters to a lot of different adventure activities which can all be enjoyed in spectacular settings. Whether your passion is surfing, mountain biking, kayaking, climbing, fishing, diving, kite surfing, hiking or caving you will be blown away at the opportunities that await you. Surf lessons, mountain biking and kayaking adventures are all popular adventure tours in Margaret River. 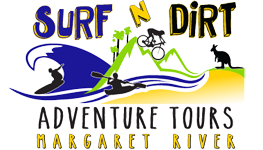 Surf N’ Dirt Adventure Tours specialize in surfing, mountain biking and kayaking adventures and offer the best adventure tours in Margaret River. This is due to the fact that Surf N’ Dirt Adventure Tours take you off the beaten track and show you locations that only Margaret River locals know and love. A Surf N’ Dirt Adventure Tour is as personalized as a tour can get as we entirely base the day on satisfying your needs. Our ‘Live the Lifestyle’ tour is one of the most popular adventure tours in Margaret River due to the fact that we take you mountain biking and kayaking in the one day. All of the locations that we take you to are well off the beaten track. This allows our guests to enjoy the solitude of nature whilst enjoying adventure activities in places that other visitors rarely get to encounter. All of Surf N’ Dirt’s Adventure Tours in Margaret River are limited to seven guests maximum. This allows us to enjoy the natural surroundings without being an instant crowd and also enables us to properly get to know our guests. If you are only passing through the Margaret River Region and are looking at joining one of the adventure tours in Margaret River then you really can’t go past a Surf N’ Dirt Adventure Tour. Check out the Your Margaret River Region website for more adventure ideas.